Backyard Vacations Are So 2009. Summer '16 Air Travel Expected To Set Record : The Two-Way The airline industry predicts it will see a 4 percent increase in passengers between June 1 and Aug. 31. The travel rush is contributing to the long waits at airport security checkpoints. Passengers wait in line to be screened at a Transportation Security Administration checkpoint at Chicago's O'Hare International Airport on Monday. Apparently, Americans are tired of taking "staycations." During the Great Recession, when layoffs and foreclosures were hitting hard, millions of people stayed home for summer vacation. Air travel fell off dramatically. Now, with jobs growing and wages rising, record numbers of passengers are booking flights. Airlines for America, the trade group for major carriers known as A4A, on Wednesday predicted that 231.1 million passengers will board U.S. airlines between June 1 and Aug. 31 — a 4 percent increase from last summer's record number. That means airlines are planning to transport about 30 million more passengers than in summer of 2009, during the depths of the recession. Not only is the improved U.S. economy helping more people afford vacation travel, but a 28.9 percent drop in fuel costs is enabling the industry to restrain fares despite higher labor costs. A4A says that collectively, airline revenue was flat during the first three months of this year, with a 6.7 percent decline in fares offsetting the 6.2 percent growth in traffic. To help accommodate the increased number of people wanting to fly, airlines will be offering 109,400 more seats compared with last summer, bringing the total to 2.78 million seats a day, A4A says. "We saw airfares fall throughout 2015 and that trend continued in the first three months of 2016," A4A economist John Heimlich said in a statement. All of that sounds rosy for travelers, but there's one big thorn that might hurt: long wait times at airport security checkpoints. Last week, Homeland Security Secretary Jeh Johnson held a news conference to offer assurances that the government is trying to fix the problem of too few checkpoint workers. "Waiting three hours for what may be a two-hour flight or 90-minute flight is not acceptable," he said. 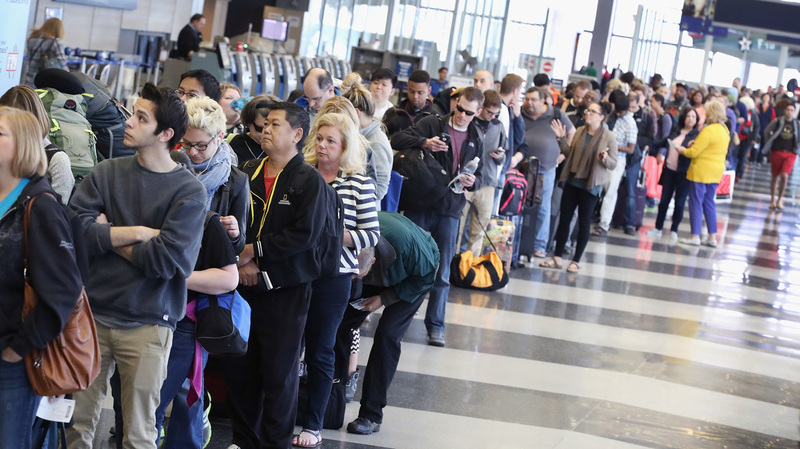 On Tuesday, Chicago Mayor Rahm Emanuel said the Transportation Security Administration is sending more security officers and authorizing more overtime pay to help relieve the hyperlong lines at Chicago's O'Hare International Airport. A4A has launched www.ihatethewait.com, a website to encourage passengers to tweet about their airport lines and send complaints to @AskTSA. The goal is to pressure the TSA, Congress and the White House to take more action to relieve long lines. During a teleconference with journalists, A4A officials were asked whether lowering airline baggage fees might encourage passengers to haul fewer carry-ons through TSA checkpoints. The answer: "There is no relationship" between steep bag fees and passengers trying to push bulging carry-ons through security. Pro Tip for Travelers: Avoid flying on Fridays in June and July. A4A says those will be the busiest travel days.